Just to add to the slew of confusing, contradictory Apple rumors constantly floating around, here’s a new one: Despite indicators that iOS devices were looking to eliminate buttons, a report from Apple Insider is suggesting it may go the opposite route – except they’ll be virtual and housed within the bezel. A new patent application titled “Electronic Devices with a Primary Display and a Selectively Illuminated Secondary Display” was filed in 2009 but curiously made public this week by the USPTO. It shows new technology that would utilize “buttons and indicators on the bezel” that would work as a “secondary display” for the iPad or iPhone. Apparently the purpose of these extra bells and whistles would be for assisting users learning their way around an iOS device and extending user interactivity without taking up more display space. Apple seems concerned with the fact that electronic buttons located directly on many devices touchscreens are taking up too much real estate – especially on smartphones. The answer? Adding more display room around the bezel which would be used for more utilitarian purposes, like help guides or even offer interactive solutions. For instance, when users are playing a game, the main display could house all of the graphics and the secondary display would turn into a region for controlling and playing the game, keeping the view all clear of fingers and hands. 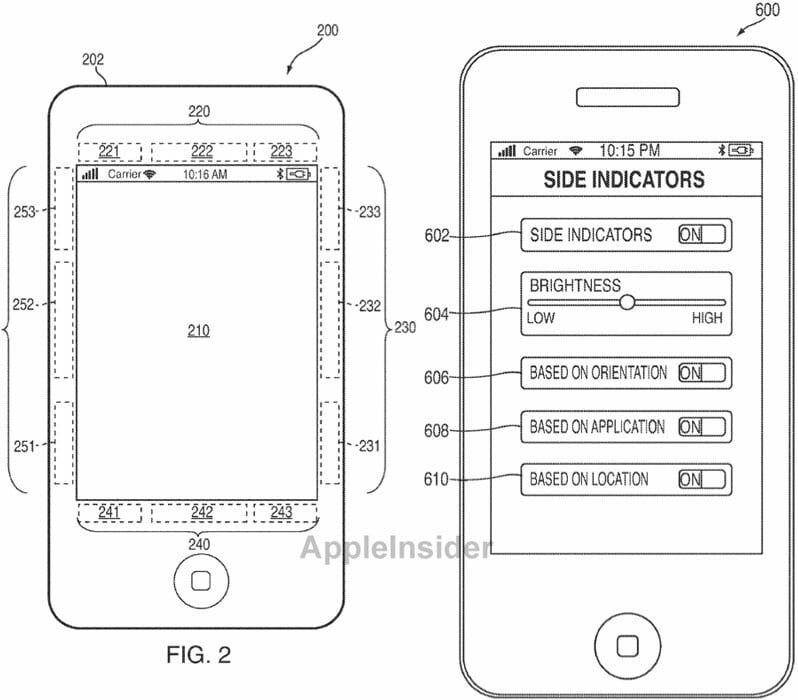 The patent indicates that the bezel would include icons that would light for various app functionalities. While our first instinct is to call this out – everyone knows how Apple feels about buttons, regardless of location – a patent application that has come from inside the company definitely rings truer than the blurry, nearly unidentifiable photos of the supposed iPod touch featuring a capacitive home button. But the button cutback rumor has been circulating for awhile now, and makes us wonder if perhaps this secondary display idea would be for a device specifically targeting gamers or other heavy interactive media users. There was another patent that surfaced recently suggesting Apple might be investing in upgrading its bezel technology, something there’s been little talk of but we see huge potential for.